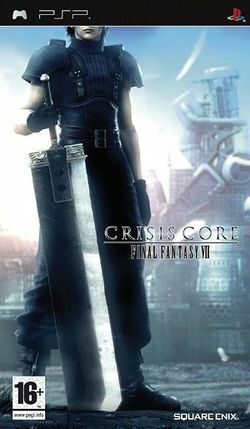 Crisis Core: Final Fantasy VII is an action role-playing game exclusively for the PlayStation Portable. This is a direct prequel to Final Fantasy VII in which the player controls Zack, a fledgling member of SOLDIER, and interacts with a number of characters from the original. The world is caught in a struggle between the people's thirst for energy and their yearning to be free. The land lies on the brink of crisis and the only thing growing as fast as the Shinra Electric Power Company's riches is its list of enemies. Thanks to its monopoly on mako energy and growing influence across the planet, Shinra has become the envy-and target of everyone. As the sole excavator and purveyor of the world's one true natural resource, Shinra is not about to let anything get in the way of its expansions. But this sort of unbridled greed can only run unchecked for so long before rebellious factions take root. Shinra is no stranger to violent protest and has historically countered any uprising with its own private army. But it's no longer enough-Shinra now needs SOLDIER. SOLDIER operatives are the company's elite guard and, equally important, have become the face of Shinra. Organized into three classes, it is the hope and dream of newcomers to one day ascend to SOLDIER 1st class and be mentioned in the same breath as the legendary Sephiroth. SOLDIER 1st Class operatives not only defend the company, but are a boon to public relations. Members like Sephiroth, Angeal, and Genesis even have their own fan clubs! It was this desire to one day become a hero like Sephiroth that drew young Zack to SOLDIER. At age 16 he's only a 2nd Class operative and still receives regular training and mentoring from his friend Angeal. Angeal accompanies Zack on his training missions and teaches him in the ways of combat, concentration, and honor. The word honor gets thrown around rather carelessly by some, but not by Angeal. When he says it he means it-and Zack knows it. As Zack's role in SOLDIER evolves and his missions grow in importance, he begins to uncover the most sinister of secrets within Shinra. And yet, even when faced with horrifying truths that make him question his own origins, it is the mentoring of Angeal that keeps him centered and focused. He is SOLDIER and nothing will ever change that. This page was last edited on 17 June 2013, at 05:17.